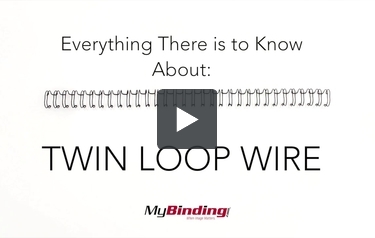 Keep it simple and professional with black twin loop wires--no need to get fancy with colors. Let your documents do the talking for you. And we have lots of options for you to choose from. We carry our own brand plus GBC and Renz, two companies that make high quality binding gear. There's 3:1 and 2:1 binding. The 3:1 pitch is used for sizes 1/4" - 9/16" and the 2:1 pitch is for sizes 5/8" - 1-1/4". We have pre-cut lengths or spools of wire, just in case you need customized lengths. Make sure the wire you choose fits your machine, and nothing will stop you, you binding fiend! Premium gloss black 2:1 twin loop wire. Premium black gloss 2:1 twin loop wire.